Howey-in-the-Hills, Fla. – Gary Gilchrist Golf Academy players continued their dominance of the International Junior Golf Tour this weekend with an impressive 1-2 finish at IJGT’s Golf World Junior Open at Falcons Fire Golf Club near Orlando. “Jack” Guanjie Wang, an 11th-grader from Shenzhen, China, led GGGA’s latest victory march after shooting 73-69 for a 2-under 142 in the highly competitive 16-19 age-group field played at the 6,808-yard Falcon’s Fire layout. It was Wang’s first victory as an academy golfer after moving from China two years ago. Meanwhile, GGGA teammate Carlos Madrigal of Venezuela shot 74-71 in another stellar performance to finish runner-up in his first top-age group event after turning 16 two weeks ago. Falcon’s Fire marked the final event before the prestigious season-ending IJGT Tournament of Champions, and many players were looking to make a final push in the merit point standings in hopes of being named to the 2009-2010 All-IJGT Team. With his final-round 69, Wang, 18, served notice he’s a force to contend with in the future. The highly acclaimed Rees Jones-designed Falcons Fire course is known for its large greenside bunkers and rolling mounds that line its fairways. After many of the golfers posed for pictures with the 20-foot falcon statue in front of the clubhouse, action began early May 15 in perfect golf conditions with temperatures hovering in the mid-to-upper 80s and lots of sunshine. Wang, who’s been working extremely hard the past few months on school and golf, was rewarded quickly by taking a first-round lead with a 1-over 73, a four-shot improvement from his season-best 77 at the IJGT ChampionsGate event. Then, the newly focused Wang was hotter than ever on Sunday, shooting his career-best round. Wang has actually been playing really well lately and credited most of his success to his putter. He also expressed his gratitude to his GGGA coaches – former PGA Tour veteran Scott Gump and Justin Kim – and the rest of the Academy for their continued strong support. Wang’s victory was particularly sweet considering he originally attended IJGT’s International Junior Golf Academy in Hilton Head, S.C. 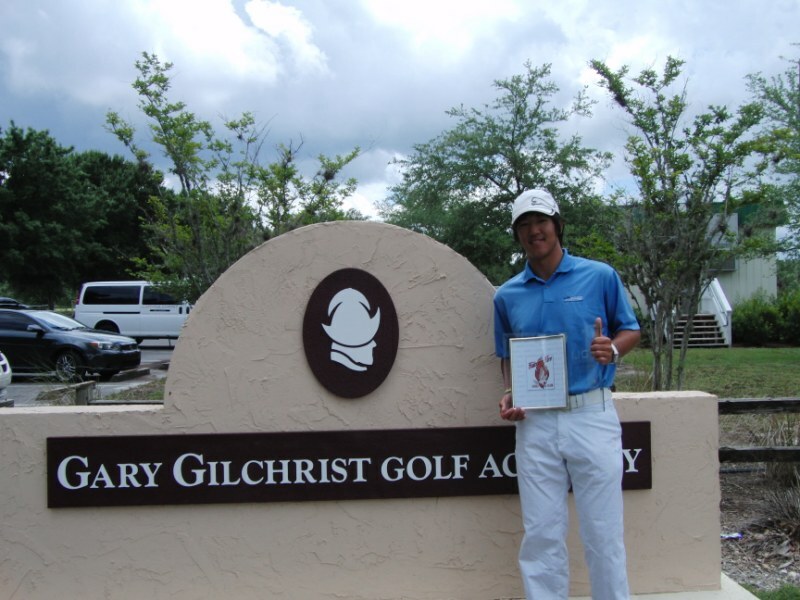 Overall, Gilchrist Academy players have now been victorious in seven IJGT tournaments this school year, including the Mid-Season tournament at World Golf Village (Emilio Maurer), TPC Tampa Bay (Maurer again), IJGT Sandpiper in Santa Barbara (Matt Hansen), IJGT at Saddlebrook Resort (Audrey Monssoh), IJGT at ChampionsGate (Takashi Maruyama), and the prestigious IJGT Tournament of Champions last May (Rodolfo Cazaubon). Even more remarkable is Wang’s victory now gives the Gilchrist Academy 29 victories this school year — from 21 different players.